Smoking Baby... makes perfect sense. Real Babies Should Never Smoke! Ceramic babies smoking, on the other hand, are strangely appealing. best of all she will not talk back ... or spend your money !! Let the Smoking Donkey take care of your smokes. Just fill his pack with cigarettes, and when you need a fix, press on his ears. Ta Da ! A fresh cigarette pops out of his behind ! A crudely charming addition to any room in the house, and a Must Have for parties ! The Smoking Donkey measures 5.5" H x 7.5" L The Donkey's pack measures 3.5" L x 1.75" W Holds up to 24 regular sized cigarettes (will not hold long cigarettes--100's 120's, etc.) 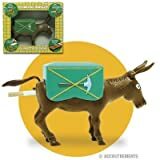 Made of lightweight plastic Packaged in a window box--suitable for gift giving A great gift for that smoker who "has everything"
Strangest Toy on Amazon.com: CIGARETTE DISPENSING DONKEY! The cigarette comes out of his what?